Animates 3D line/surface plots from table based data. Is there a better alternative to 3D Data Visualizer Pro? Is 3D Data Visualizer Pro really the best app in Animation category? Will 3D Data Visualizer Pro work good on macOS 10.13.4? 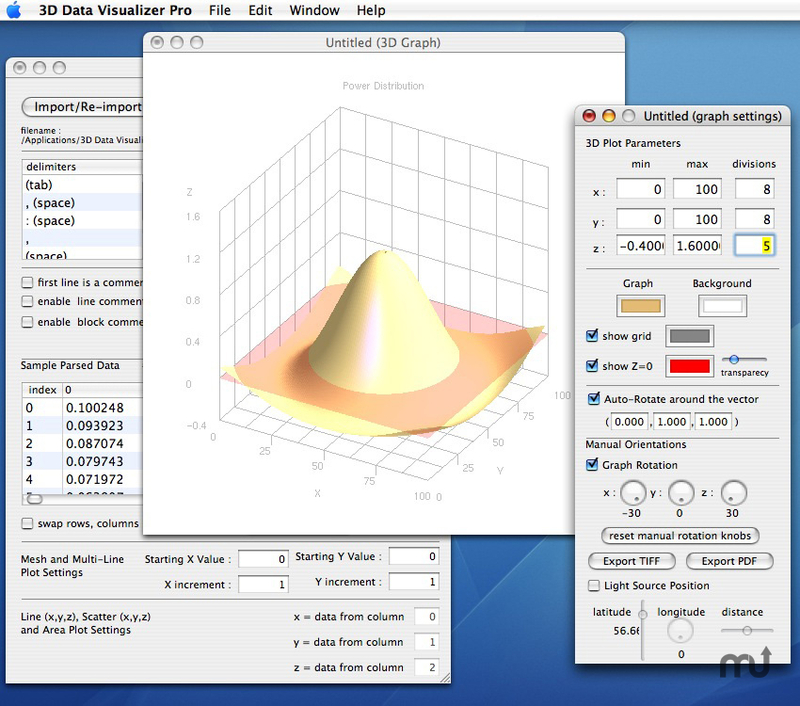 3D Data Visualizer Pro quickly creates and animates great 3D line, surface, and scatter plots from table based data. Choose your delimiter type(s), and select the type of plot desired. Specify your desired colors, lighting, and rotation, and animation. Also available: 3D Data Visualizer version 1.0.3. Freeware. 3D Data Visualizer Pro needs a rating. Be the first to rate this app and get the discussion started! Orthographic projections simplify taking measurements. Transpose Your Data Sets - swap rows for columns when loading in your data. Specify line thickness and point size for line and scatter plots. heat, cold, fluid, hue, spectrum, xray, etc. Bug Fix - In version 1.0.4, image textures may not appear when using a PowerMac G5 and certain Nvidia graphics cards. This bug is fixed in version 1.0.5.